The 2018 cohort of ISTerns sporting their new hoodies. Outstanding bachelor’s and master’s students from all over the world can join IST Austria in the ISTernship program. Students who are interested in basic research in the fields of biology, computer science, data science, mathematics, physics, neuroscience and interdisciplinary areas, are encouraged to apply. The application deadline for the ISTernship program for the summer of 2019 has already passed. The next call will open in December 2019, when a link to the online application tool will be published. The application deadline for the 2020 ISTernship is in February 2020. The ISTernship (“IST-” + “(int)ernship“) is a summer internship program for bachelor’s and master’s students who are looking to expand their scientific research experience. 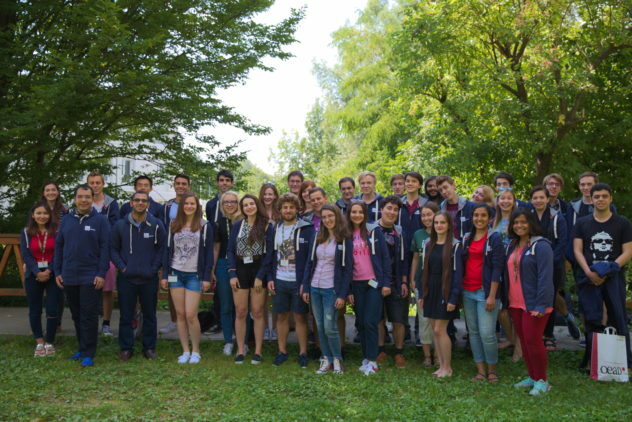 Every summer since 2013, roughly 30-40 students join the ISTernship program and work closely with our faculty or a lab member on a short research project. As part of the application, prospective interns choose a group to work in, and successful applicants agree on a research project with the group leader. The participating faculty will be announced latest when the call opens. Upon arrival, ISTerns receive an introduction to research at IST Austria as well as an introduction to the IST Austria Graduate School. The program culminates with a research symposium, where ISTerns present their work to peers, faculty and lab mentors. For more information and frequently asked questions, see the ISTernship FAQ. 8–12 weeks between May 15 and September 15. Exact dates and length are decided together with the supervisor. The application deadline for the ISTernship program for the summer of 2019 has already passed. The next call will open in December 2019 and will be open until February 2020. More specific information will be published closer to the application period. For more detailed information about the application, see the ISTernship FAQ. Successful applicants receive assistance with travel and visa arrangements. Each successful candidate receives compensation to assist with the cost of living in Austria and travel to and from Austria. It is also possible to do a scientific internship (year-round) at IST Austria. See this page to find out more.